One of the best ways to celebrate Independence Day is by taking in a fireworks show. There are several shows to choose from around the lake. My favorite viewing area is from a boat, but there are plenty of places to view from around the shore. Get to your viewing location early because parking may be difficult. Traffic will likely be a problem when you leave. Kings Beach: Fireworks are a day early on July 3, 2013. There will be a beach party at Kings Beach State Park beginning at 2:00pm. Fireworks at 9:30pm. 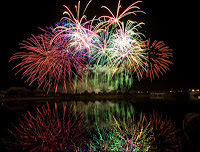 South Lake Tahoe: “Lights on the Lake” will begin at 9:45pm on July 4. This is one of the biggest shows in the nation. The best viewing is from Nevada Beach, Edgewood-Tahoe, Reagan Beach, and El Dorado Beach. There will also be a July 4 parade starting at Big 5 on the "Y", 10:00am. Tahoe City: 67th Annual Commons Beach fireworks show begins at dusk. Incline Village: July 4, at 9:30pm from Incline Beach. Other festivities are celebrated July 3 through July 6. Truckee: July 4, 9:30pm. West End Beach at Donner Lake. The Truckee July 4 parade begins at 10:00am. The “Firecracker” 1 mile run begins at 9:45am on Donner Pass Road. **Possession of any fireworks (including sparklers) is illegal in the Lake Tahoe Basin. Several Lake Tahoe beaches will have alcohol restrictions over the fourth, as well as a ban along the Truckee River from Tahoe City to Alpine Meadows.